The oil market is entering a bearish phase. It sends shivers down the spine of many oil-producing countries as they rework their federal budgets, which are massively dependent on oil and gas revenue. Malaysia is not spared from this and stands to lose billions of ringgit if crude prices remain as low as $85 USD per barrel. Is this another regular jitter in the oil cycle or is something being manufactured to push down the price of oil? The cue perhaps can be found in the latest speech made by the embattled Russian premier, Vladimir Putin, in Sochi last month. Putin's recent rhetoric at an event organized by the Valdai International Discussion Club – an annual elite gathering among statesmen, scholars and entrepreneurs to discuss Russia's role in the international arena – pretty much sums up the tense geopolitical climate between the Western powers, especially the US and the rising Sino-Russian alliance. Noted by many as his most important speech on international affairs, Putin made a clarion call to the international community on the need to have a balance of power in counterweighing Washington’s global influence. 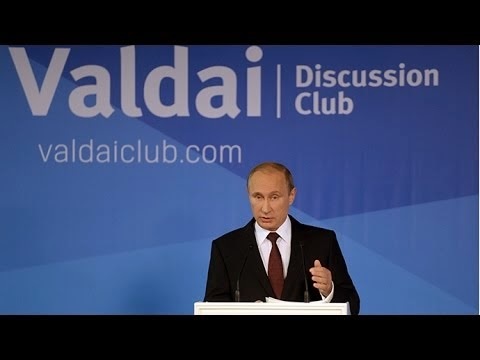 Putin believes that US-centricity and unipolarity have permeated into various international bodies like UN, WTO, World Bank – bringing with it more disorder than before, challenging the very foundation of the Wesphatlian international system that characterizes our modern world. The rhetoric in truth is just an icing on the cake for Putin. Earlier this year, he made a few strategic moves that really ruffled Washington’s feathers. Besides the establishment of BRICS international bank that many sees as a challenge to US and Euro-led World Bank and IMF, Putin has also struck a deal with China for a 3-year rouble-yuan currency swap deal and a 30-year agreement for China to purchase Russia’s natural gas, both amounting up to $25 billion and $400 billion USD respectively. Such moves are definitely signs of a growing Sino-Russian alliance, aimed at allowing both states to decouple themselves from an international monetary system that has always been dominated by the US dollar. Washington views these developments as a significant threat, knowing very well that the two giants wield massive influence in Eurasian politics and the world economy. While maintaining the traditional physical containment via NATO-led forces around Russia’s backyard, Obama has now resorted to an economic containment policy by sanctioning Russia, but with very minimal impact. US-led economic sanctions have backfired, as its EU allies seem unsupportive of further tightening. Russia – being the single largest supplier of European energy needs, from gas to coal – will surely have the last laugh this coming winter if the EU presses ahead with sanctions. They dare not fight an economic war with Russia when they know they badly need Russian gas to warm their homes. Putin has now checkmated Obama’s sanctions. All is not lost, as Washington still has one card to be played that can really devastate Russian economy: the Petrodollar. Half of Russia's massive federal budget is derived from the revenue generated by its oil and gas-related activities. According to the US Energy Information Administration, oil and natural gas sales accounted for 68% of Russia’s total export revenue in 2013. This makes Russia as one of the largest oil and gas producers in the world, or a petro-state like other OPEC behemoths. As its EU allies show glaring vulnerabilities, the US is in need of a more powerful ally to pry open the chink on Russia’s economic armor. It is natural for Washington to turn to their long-time ally - Saudi Arabia - to finish what the EU has failed to do. The Saudis are the best party to perform this job, as they have proven to be Washington’s most loyal and able ally in the Middle East, but also pretty much isolated from Russia’s virulent energy politics. On top of the surge in US shale oil and the resuming of Libya's oil production, the real factor that drives down global oil prices is none other than the move made by the Saudis, who have ramped up production, despite knowing fully well as an OPEC swing producer that its production profile wields massive influence in determining the supply and demand equilibrium, hence the global oil price. The calls of other OPEC members for Saudi Arabia to halt its uneconomic moves only fell on deaf ears. Citing the reason of ‘reclaiming market share’, Riyadh’s incessant oil production will surely jeopardize and destabilize the oil market further. This deliberate act is something that both the US and Saudis can stomach economically. Most importantly, it represents strong, underlying geopolitical interests aimed to contain their common petro-state adversaries: Russia and Iran, who dare to challenge the hegemony of the US dollar in oil trade – better known as the petrodollar. As oil production increases, the US dollar is simultaneously being printed and will find its way to the international market. As the demand for oil grows, so does the demand for US dollars. Washington’s hard power grows in tandem with the rise of US dollar as the sole-preferable, a lockstep currency in oil trading. At this stage, Russia has suffered tremendously and the impact is more severe than the imposed economic sanctions. Just by reducing the price of crude by $12 USD, experts estimate that Russia will lose $40 billion USD in oil revenue. This act prompts a reminder of the same geopolitical strategy used by the US, through the role of the Saudis, to weaken the then Soviet Union's economy in 1985 by flooding the market with cheap oil that pushed the price as low as $10 USD per barrel. The dwindling down of the USSR’s export revenue, which many believe was dependent on oil exports, was one of the precipitating factors that lead to the collapse of the Soviet empire in the early 90s. Putin has every right to question interventionist US policies, not only in the former Soviet republics that surround Russia’s borders, but also in the hegemonic role of US dollar in an international trading system that only serves Washington’s strategic interests at the expense of other nation’s growth and prosperity. Indeed, this move by Washington and Riyadh is another act to preserve the present world order, which has been largely shaped by the unipolar policies of the US as the main victor of World War II. The author is a Fellow at Putra Business School, Malaysia.